We are known for many things in Colorado. Most recently, we’ve received national recognition for our budding cannabis industry. But we are also known for our tall peaks, world class skiing, thriving organic food industry and tasty craft beer. One thing that people don’t tend to think of when considering Colorado is the state’s wine industry. However, it does exist. Somewhere in between the lack of quality jokes and the “I’d rather be tasting in Napa” comments, Colorado actually does have wineries … and they’re producing wine. I knew very little about Colorado vino, except that is wasn’t from California. The grapes grown in Colorado seem to be met with heavy scrutiny. They’re too harsh, lack finesse and are just generally immature, at least, that’s what people say. We only have 113 wineries (according to the Aspen Times Weekly) and California has approximately 3,754 (according to the Wine Institute). If America’s wine industry was a high school, then Colorado wines would be taking the short bus in every morning. At least, that’s the impression I’ve gotten. But I’m not one to discriminate, particularly when it comes to fruit that eventually turns into an alcoholic beverage. So, with my 25th birthday fast approaching and being in need of some way to celebrate, I decided to gather a few of my closest friends, a driver and a bus and go explore Colorado’s wine country for a day. Originally, I wanted to go to all of the possible wine destinations I could reach in one day. 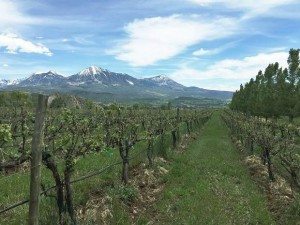 The closest to Aspen are in Grand Junction, Palisade and Paonia (together these areas produce 90 percent of the state’s wine). However, after some wise advice from the Aspen Times Weekly’s wine sensei Kelly Hayes, I narrowed my sites to Paonia, also known to be part of the West Elks area. So on Saturday, May 30 (two days before I turned a quarter-of-a-century-old) I went with 12 friends to Paonia to test out some wines. The group I brought was eager, but most, including myself, were relatively inexperienced with wines grown in Colorado. Excited to learn, we started at Azura Cellars, a beautiful winery and gallery overlooking Mount Lamborn and the quaint town of Paonia. This place actually grows its grapes in Palisade and packages in Paonia. On their grounds, they have a nice pond and a gallery with reasonably priced art and jewelry. If we hadn’t had a full schedule, we probably could’ve sat out there all day soaking in the sun and sipping on the Merlot and Riesling. That’s probably true about every place we went actually. But I had made an itinerary, and we were going to try out damndest to stick to it! Next up was Delicious Orchards, which sells Big B’s Organic Juices and Hard Ciders. This is a far cry from a winery, but we thought it best to mix things up a bit. Plus, it was so impressive to see a company start, literally, at grassroots and gain popularity all over the state. In fact, the juices are sold in Whole Foods in Colorado, New Mexico, Utah and Kansas. Afterward we headed to lunch at Living Farm Café, a relaxing restaurant that makes most of its dishes with local ingredients. Plus, it’s cheap. My burger (topped with Avalanche Cheese’s goat cheese) was only $10. Only place in Aspen that a price like that is possible is at Justice Snow’s. After we ate (and kept on drinking, of course) we were off to more wineries. First stop after lunch was Stone Cottage Cellars, then its neighbor Terror Creek Winery. Lastly, we went to Black Bridge Winery. We were all very impressed with each stop. Some of my personal favorites were the Syrah at Stone Cottage, the oak-free Chardonnay by Terror Creek and the Gewürztraminer and Merlot at Black Bridge. Looking back on the intoxicating day, it’s difficult to differentiate every taste. As more wines soaked our taste buds, most liquids began to taste the same. What did change was the atmosphere of each place we visited. Every winery had its own personality, which made it hard to choose a favorite. What also stuck with me were the different people. From an aerospace engineer who left his field to farm grapes to an older woman who waitressed at the Red Onion in her twenties, everyone had an interesting story and a good reason for landing in Paonia. With passionate and talented people at Colorado Wine Country’s helm, I would say we have a promising future ahead of us. Even if we will never get to ride the bus with the cool kids from Napa and Sonoma Valley. Barbara Platts can’t wait for her next Colorado wine tasting adventure. Reach her atbplatts.000@gmail.com or on Twitter @BarbaraPlatts.